In today’s manufacturing industry, Enterprise Resource Planning (ERP) solutions have become ubiquitous. In fact, Aberdeen’s “2014 Business Management and ERP Benchmark Survey” found that 97% of leading manufacturers utilize ERP, in comparison to 88% of followers. But just because an organization has implemented ERP, it doesn't mean that they're getting the most out of their technology environment. Rather, top performing manufacturers ensure that their ERP solution is being used to its fullest extent by their employees, in roles that spread across the organization. 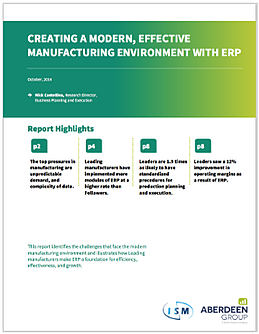 This report identifies the challenges that face the modern manufacturing environment and illustrates how leading manufacturers make ERP a foundation for efficiency, effectiveness, and growth.